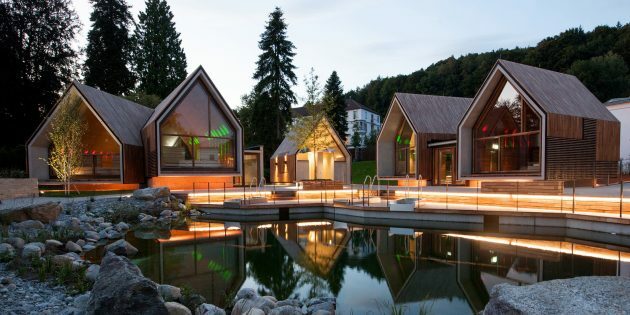 Jeschke Architektur & Planung – a Munich-based architectural studio has completed the Jordanbad Sauna Village spa complex in Biberach, Germany. 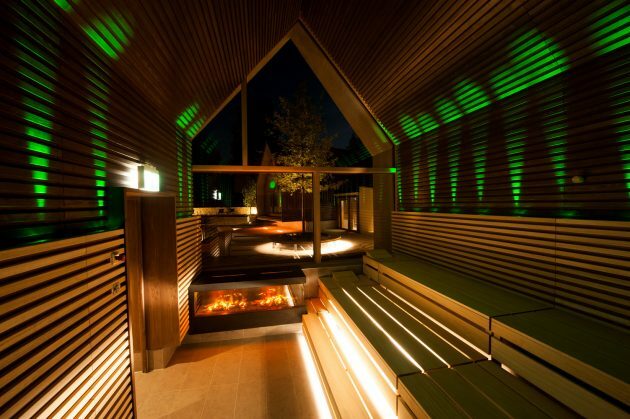 The saunas are designed to look as good as they make you feel. 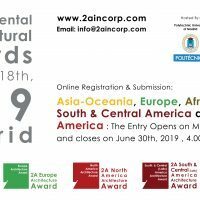 The buildings are clad in timber in the shape of beautiful gabled huts featuring large glazed end-walls that overlook the adjacent pond and landscape. 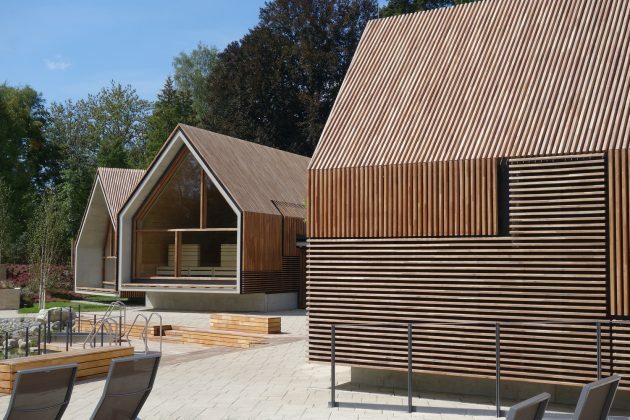 From the architects: “The former outdoor sauna huts of Jordanbad in Biberach, Germany, were supposed to be replaced by a new, durable and sustainable, larger and more spacious sauna village. 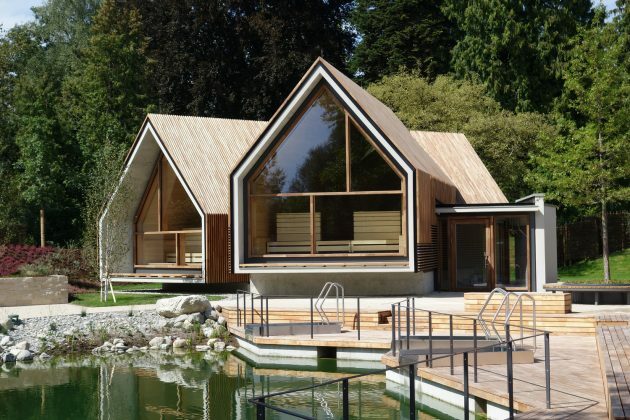 The extensibility of the sauna complex and grounds was planned in a comprehensive master plan in order to expand and add further saunas and relaxation rooms easily in later years. 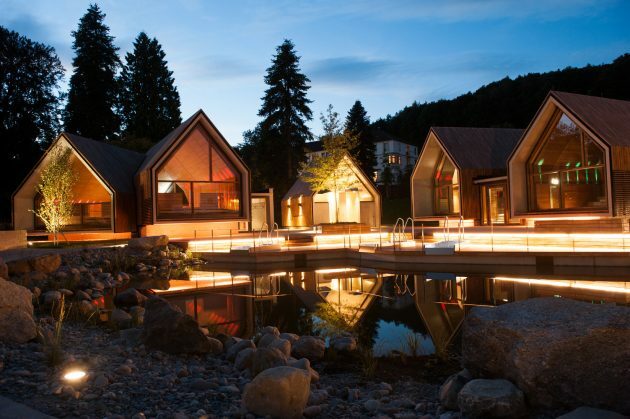 All successful spa complexes should be designed as a constantly growing process. 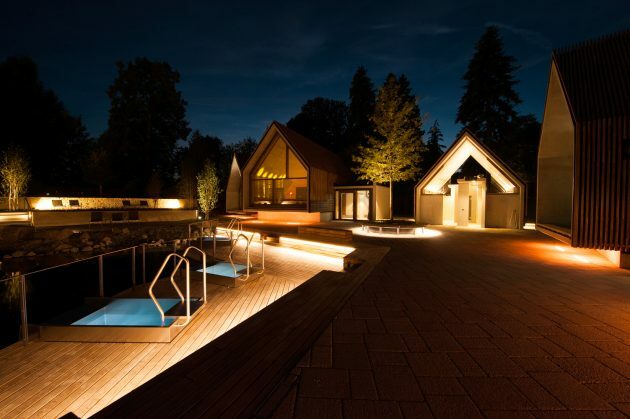 The aim of the redevelopment was to increase the appeal and feel-good factor of this spa and to create more interesting spaces for a larger number of visitors. 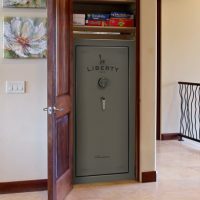 “The water / shower center is situated in a separate building – with a variety of shower facilities, outside there is a large open waterfall shower. 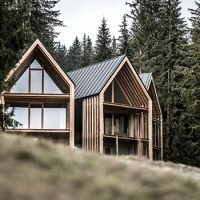 The overall complex is designed as a kind of new‚ ´modern´ village – with gabled-roof sauna houses. 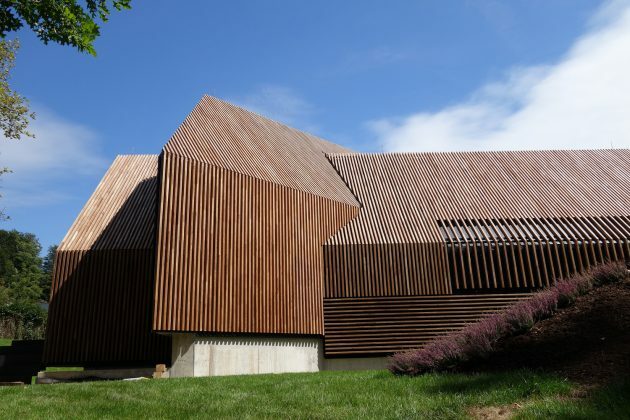 Their side-facades and roofs are all structured in the same type of surface design with Robinia wood slats – in a vertical and horizontal pattern. 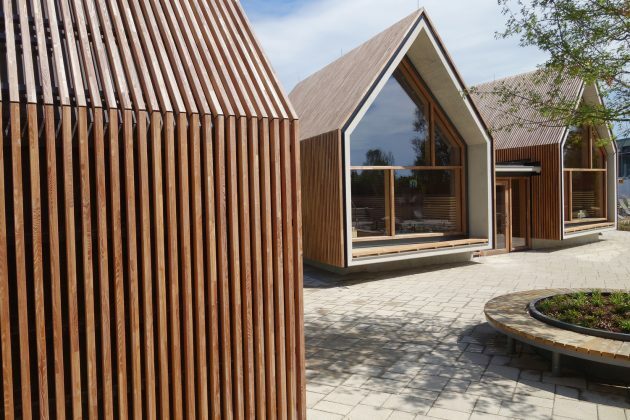 Particularly important was the arrangement of the various sauna houses with well-proportioned intermediate space, which forms the key quality of the village as sauna complex. 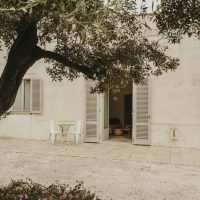 In the center of the complex there is a large pond – with wooden decks and benches for sunbathing in the south-west sun on one side – with a soft pebble shore and big boulders for seating on the other side. On the soft, more natural side of the pond, there are semicircles of paved terraces for sunbathing. 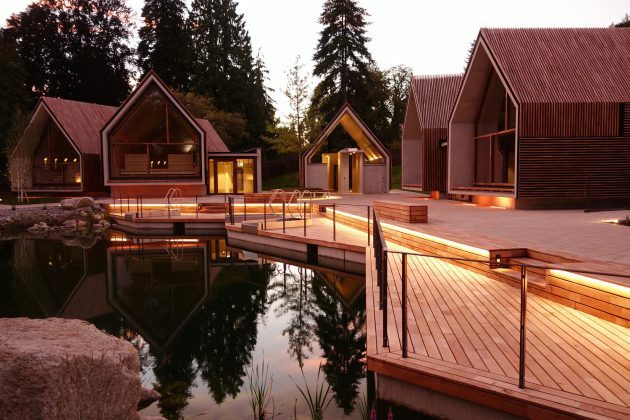 Three immersion pools – each 2m2 – are located on the wooden deck, facing the pond – they can be filled with warm or cold water depending on the season. 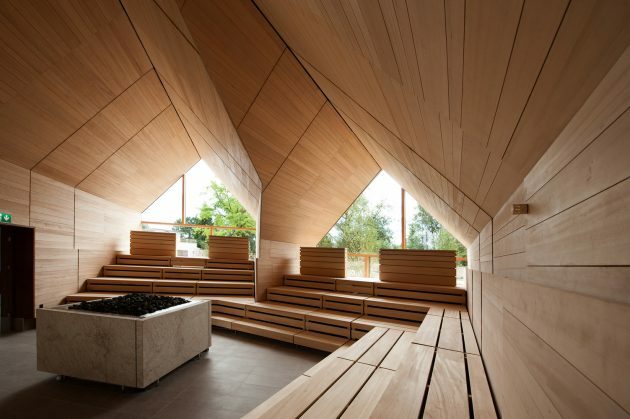 A tree in front of the water center with a bench seat forms the central meeting point for the sauna users. 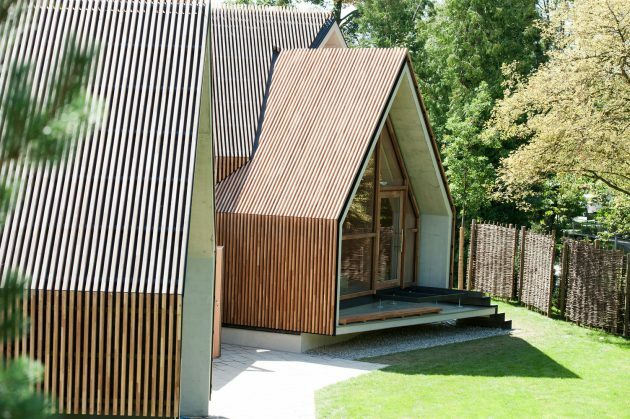 The client preferred a more longlasting construction method for the buildings – after his sad experience with the previous short-living log-cabins. 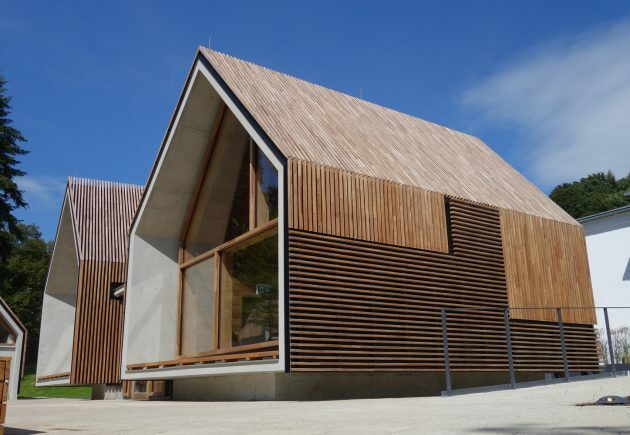 The result of these discussions was a concrete construction as center of all walls and roofs – covered inside and outside with layers of wood. 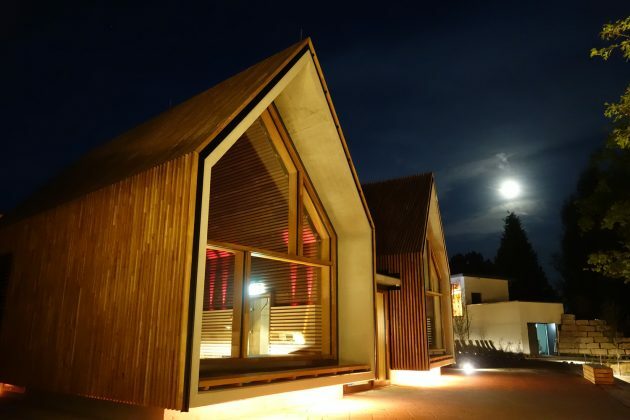 “The volume of the infusion sauna is created by the intersection of two gabled houses – for combining several more intimate space volumes with one large space – for all kinds of Sauna ceremonies for up to 120 persons. 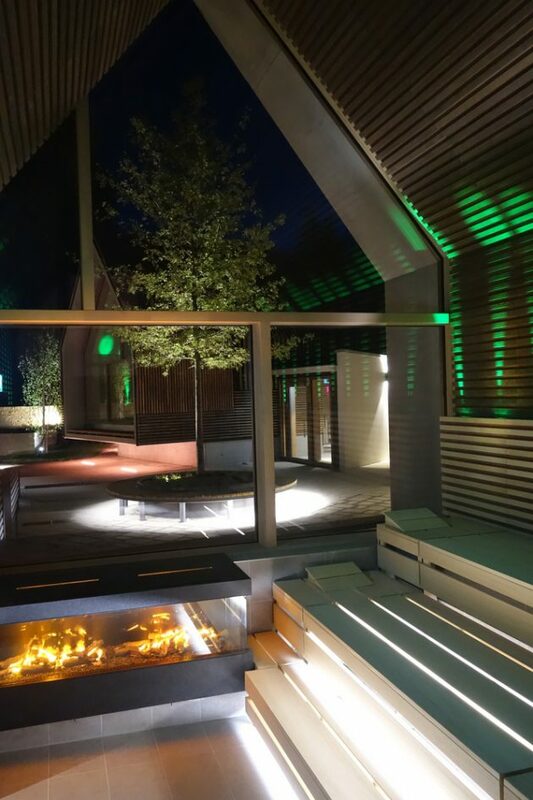 The visitors can sit with nice views outside, enjoy relaxing tranquility in the three areas on one side – and in the other direction the sauna users look into the center with a large sauna oven in the middle and enjoy the communal sauna experience in the large, high intersecting center space. 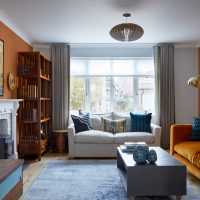 The intimate fireplace sauna has a large attractive fireplace as an eyecatcher at the front of the wide opening panoramic window and has walls out of especially narrow wood-strips. 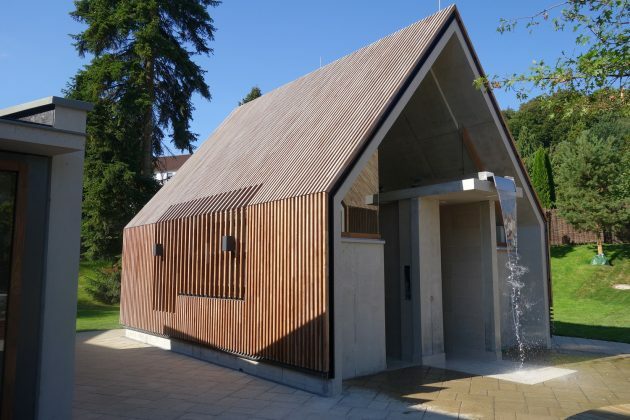 The herbal sauna has an atmospheric ‘herbal oven‘ out of slate in its center with an integrated herb-basin out of natural stone. 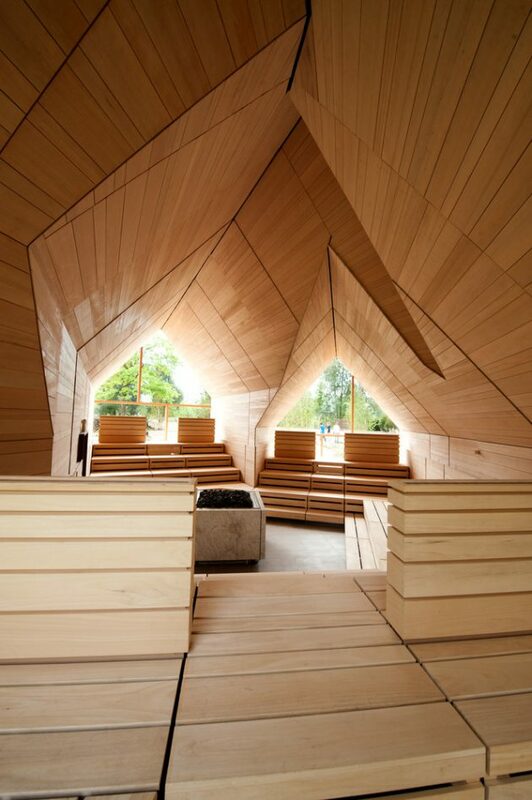 Herbal aromas flow through this sauna- and walls are covered with large wooden panels. 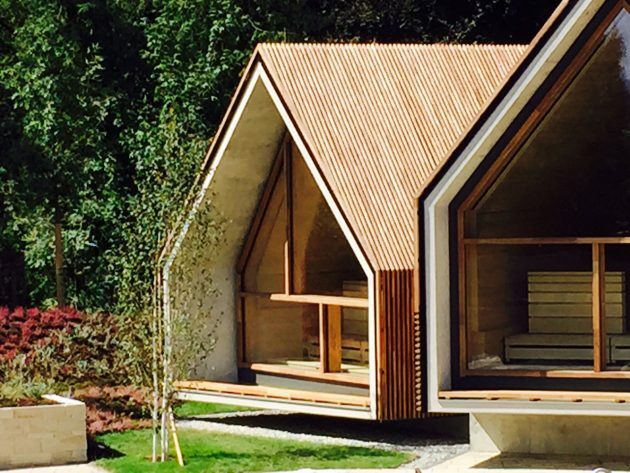 “The design style of the sauna village is a contemporary architectural language – free of kitch – creating rich extraordinary experiences for the visitors by careful use of space and form, light and material – inside and outside. 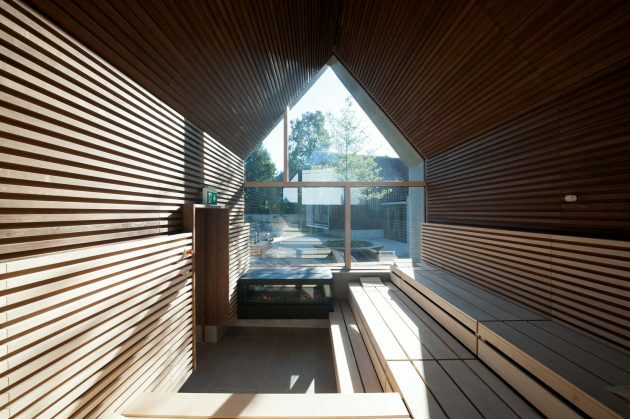 Inside, each sauna has its own individual atmosphere – with carefully chosen views into various parts of the garden, landscape and pond through large panorama windows. 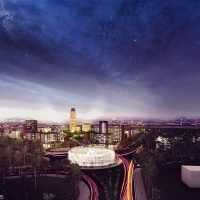 A cost-saving, ecological form of energy supply has been chosen for the sauna village. The electric power and heat generated by the power unit (CHP) can cover the complete electricity and heat demand for hot water and heating. By means of an exhaust gas thermal oil heat exchanger, the energy is transported through thermal oil (temp. about 260 ° C) into pipelines to the individual, specially designed thermal oil heaters.